As a beneficiary of Rotaract Blue’s Open Arms Programme, the Lighthouse School has received approx CI$5000 in donations over the past 6 years. To recognize this, a sign is currently displayed at the school entrance. The Open Arms Program promotes non-discrimination for disabled persons. It also aims to help integrate those living with disabilities into the comm community and provides much needed support to those who care for them. One of its main goals is to enhance society’s understanding of the needs of dis disabled persons while honouring those who care for them. Other beneficiaries of the programme include Maples House, Special Olympics Cayman Islands, Sunrise Adult Learning Centre and Special Needs Foundation of the Cayman Islands. 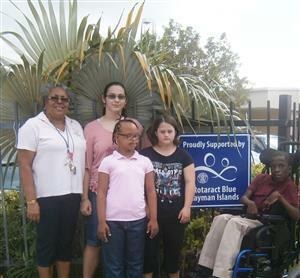 Photo caption: Lighthouse School Principal Olga Gourzong and students are happy to show off their new sign.